Great brands. Great products. Great prices. Great service. Probably the largest producer of wooden puzzles in Europe, the goki brand has been developed over 35 years to meet the critical demands of consumers and children alike. With a range of products starting at Early Years and spanning all the educational categories on the market, there is really something for every pocket and every taste in this huge range. Holztiger is the brand to go to for anyone looking for unique, quality, hand crafted wooden animals at surprisingly affordable prices. Now well established on both the UK and European markets, we feel confident in saying that there really is no competition to this brand. 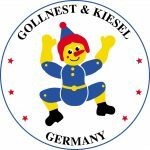 Heimess has been around over 50 years and makes wooden toys for babies. Made in Germany, quality and safety are paramount and assured. Probably the largest range of soother chains in the world – the unique “rotating connector” ensures a good fit to virtually any soother made. K-Play are the global distributors of the new products from mightysmall. Guaranteed to be a hit when they launch later in August 2018. Aimed at providing solutions for parents challenging moments with their children such as taking medicine, eating well and sleeping well, we will start off with Marvin. Come back soon to learn more or contact us by email to be kept updated. The PlayMeal Surprise Bowl is designed to take the challenge out of mealtimes with fussy eaters. Guaranteed to be a huge success when it launches in November 2017. We have already had firm interest both at home and abroad. Use it at home or on your travels; this bowl is sure to make life easier. Enjoy our soft play Pillowfight Warriors® Armour and Shields, perfect for indoor or outdoor fun and designed with historical accuracy to take you back to the marauding Viking Age. Let your imagination run wild as you sail your longship far and wide, invading your brother or sisters’ bedroom to pillage and fill your hoard with treasures from far lands. Play and explore with our super soft play Viking themed Pillowfight Warriors® Armour and Shields. 21 years experience. Unparalleled customer service. At K-Play, we have over 20 years of experience in working with the toy & gift trade. From small market stalls through to multi-national stores, whether they be bricks & mortar, mail order or online, we have the know how to place your product with the right retailers in the right market. We support both our customers and our manufacturers through in depth knowledge of the UK market and unparalleled customer service. We can do all the marketing for our manufacturers including mail outs, emails, Trade Fairs and personal visits. We can run your entire business in the UK or simply provide the necessary day to day services such as order processing, invoicing and accounting, to allow you to get on with what you do best - design and production. We make the whole experience for foreign and domestic manufacturers a rewarding way of entering, developing and increasing turnover in the UK, whilst maintaining control over their own business. We supply many of the top UK schools suppliers. We deal with some of the biggest online retailers. We supply many attractions as well as many of the top UK & London museums. NEW Australian children’s brand, here to solve parenting problems through play. Imaginative and creative ways to help parents with common challenges such as getting kids to take medicine, eat and share well. Available from the beginning of November. K-Play is the Distributor of the PlayMeal Surprise Bowl. Available from the beginning of November the PlayMeal Surprise Bowl is designed to make mealtimes less stressful and more fun. K-Play is the exclusive UK agent for all Gollnest & Kiesel brands. goki – beautiful and practical wooden toys made in own factories. Holztiger – handmade wooden animals made in own factory Heimess – one of the oldest producers of wooden toys from birth up – Made in Germay. K-Play is the exclusive UK Agent for History Heroes. History Heroes card games are games for all ages, entertaining and bringing a new understanding of the men, women and children, who have shaped the world around us. The award-winning,pocket sized card games deliver 1000 years of history in each small box and detail the 40 greatest ‘heroes’ in each theme. The aim of the games is simple: win a game by winning the cards and win the cards by learning and knowing the facts. Our own brand of fab fun! Enjoy our soft play Pillowfight Warriors® Armour and Shields, perfect for indoor or outdoor fun and are designed with historical accuracy to take you back to the marauding Viking Age. Let your imagination run wild as you sail your longship far and wide, invading your brother or sisters’ bedroom to pillage and fill your hoard with treasures from far lands. Play and explore with our super soft play Viking themed Pillowfight Warriors® Armour and Shields. Once again we are supporting the only true nursery fair in the UK. Come and visit us on Stand Q1 for great brands and offers. From Sunday 24th to Tuesday 26th March 2019. Come and visit us on the last UK show of the year and see all of our new product launching September 2019. We’re right in the middle of things in Hall 6 on Stand 6D71. 19-22 September 2019 After a hugely successful 2018, we will once again be available for interested distributors and retailers to discuss the launching our new ranges to European & Global markets. Not to be missed!